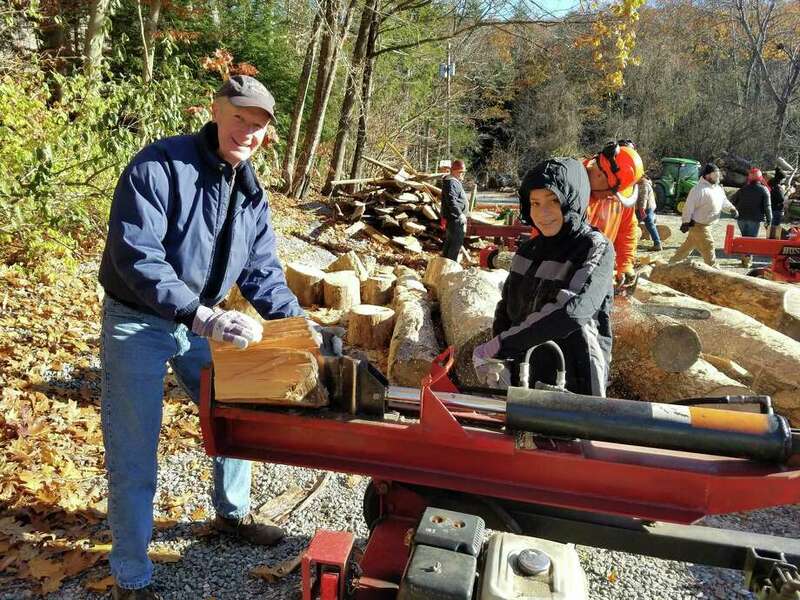 Mark and Nick Mathias using a log splitter at YMCA Camp Jewell in Colebrook, Connecticut on Saturday, Nov. 11. Last weekend, my family had the pleasure of going to YMCA Camp Jewell in Colebrook, Connecticut for a Family Work/Fun Weekend. During these weekends, families who are friends of Camp Jewell work on various projects around the camp, usually cleaning up or building things. This past weekend, my family spent most of our time splitting wood. There were about 60 people on this project and it was noisy. In particular, the dozen chain saws, 9 lot splitters a tractor and a “gator” (a ruggedized golf cart) made a LOT of noise. This made communicating with each other very difficult, as with all those machines operating, there was never a quiet moment and even inches from other people, they couldn’t hear each other. So we had to rely on hand signals to communicate with each other. My family spent most of our time operating a lot splitter. In the two-operator configuration, there are a few hand signals that are needed for the person operating the hydraulic ram: Stop, Forward and Reverse. Luckily, these hand motions are pretty easily learned and understood. In the evening, as I my muscles were complaining about how much I had used them that day, I was pondering the other ways in which people communicate without speaking and without our now popular digital communications such as email and texting. I was reminded of a time I was in an ice cream shop and a group of people who couldn’t speak came in. One of them wanted to smoke, so couldn’t sit inside the ice cream store with the others. The one who smoked sat outside, yet using sign language, was able to carry on a completely engaged conversation with those who remained inside the ice cream shop. This hit me as a very creative way to communicate and one in which would never cross my mind as even being possible, as I am not skilled in sign language. I was also reminded of the ways that Navy ships would communicate with each other using Morse Code and light signals that could only be seen by the recipient ship. As long as both ships had these light signals, they can send messages back and forth without fear of being intercepted by others. This was a reminder of all of the ways we communicate with each other. Whether it be a letter in the mail, an email, a text message, a Facebook posting, sign language, Morse code or even a smile, a touch or a spoken word. Each form of communication has its own strengths, nuances and subtleties. Mastering each of these is a lifelong learning session for most of us. As we come upon this Thanksgiving season, take some time to be thankful for everything we have, especially the people who make our lives wonderful. These people are the most precious. Send them a message in whatever form you think they will best receive. Let them know you are thankful for them.